Are you a regular NPR listener? If so, you have probably heard of StoryCorps, a program endeavoring to chronicle the histories of normal, everyday people like us. StoryCorps embraces the idea that, in a world of celebrity gossip and sensationalism, the truth and beauty in everyday American life is more important and interesting than the tabloids could ever be. Each Friday, StoryCorps features a recorded interview of two people- it could be a husband and wife, a mother and daughter, two brothers, two friends-who share a common love and respect for each other and a genuine willingness to listen to the other's most poignant and personal story. One week you might hear a couple talking about the joy a disabled or terminally ill child has brought to their lives, another week you might hear a teenage boy interviewing his grandfather about his childhood. The commonality in all these stories is the instance of two people taking the time to really listen and to be present with each other, the idea that listening really is an act of pure and simple love. Of course, not every story gets heard on NPR, but an audio copy of each story does get filed at the Library of Congress as an oral record of this project. Although a StoryCorps mobile booth travels the country, there is a permanent booth located in lower Manhattan. I had the wonderful opportunity to visit the booth last weekend to interview a special friend while on a trip to New York. We crammed ourselves into this cozy room with only a small table, a dim light, and two microphones between us. Our StoryCorps facilitator, Mike, faded into the background as we began our conversation. We laughed, we cried. We connected. Despite my prior cramming as the interviewer, I put my list of questions away and we let the conversation unfold as only the best, most intimate conversations can. An hour later we walked out into the crisp November New York air with a CD recording of our time spent together in that little space. It was a beautiful day. 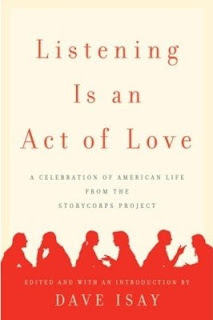 Last winter, at the shop, we carried the hardcover of Listening Is An Act of Love: A Celebration of American Life From the StoryCorps Project, a compilation of only a few of the tens of thousands of interviews that have taken place since the program began in 2003 in New York's Grand Central Station. I had spent many Friday mornings in my car already, listening to some of these stories, crying my eyes out, and marveling at the lessons taught not only the people speaking but to me, the listener. So, naturally the book was an added treat. It was then, in my opinion, the perfect Valentine's gift. Now, the book is newly out in paperback, and it still makes a lovely gift for someone who you love to listen to. Or for someone who takes the time to listen to you. The interviews in this book will make you think about telling your story to a loved one, as well as listening to his or her story too. You don't have to cram yourself into a tiny booth in downtown NYC to do these things, after all. Don't we all need to be better listeners? Don't we all want our stories to be heard? Hello from StoryCorps! Thanks so much for mentioning “Listening is an Act of Love” and posting about the project: hearing the reactions to the broadcasts is so often as touching and inspiring as listening to the stories themselves! I thought you and your readers might like to know about a new initiative StoryCorps is launching to make conducting these interviews easier. This November 28th, the day after Thanksgiving, StoryCorps is launching the first-ever National Day of Listening. We’re asking Americans to set aside an hour to record a conversation with a friend, family member, or loved one. We've launched a separate website (http://www.nationaldayoflistening.org) with more tools and tips, a downloadable guide, and an instructional video for recording family and friends the day after Thanksgiving and beyond. Thanks again for helping us build a movement to honor the people in our lives through listening to them!